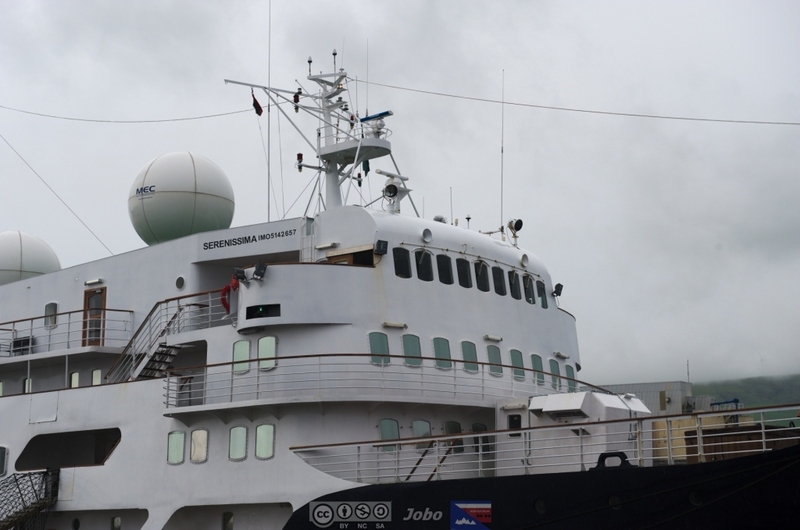 I must say, the former HJ.... the Serenissima has certainly covered the globe extensively after her career in Norway. Quite impressive for this small ship. 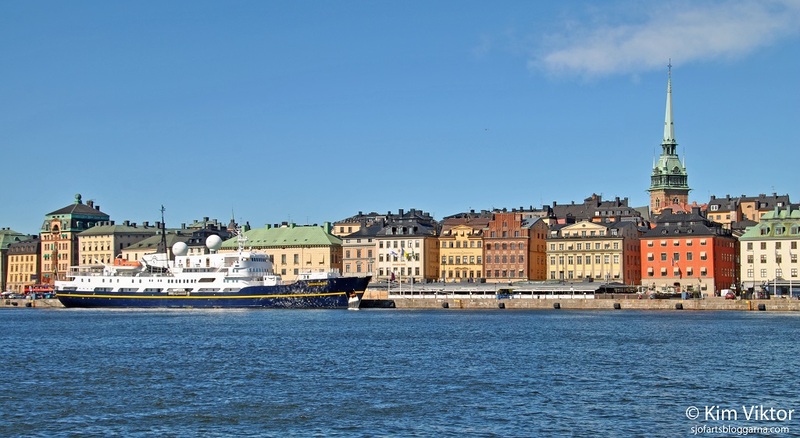 Serenissima came with good weather to Stockholm! After 2 weeks with a lot of rain, could the passenger onboard on Serenissima enjoy some sunshine (and pretty warm to be in Stockholm). Very nice pictures of one of our most favourite ships! And welcome to the forum! What would the white patch be under her starboard anchor? It is there in all photos of her at different angles. Usually one sees a rusty patch developing. Nari - Both anchors are ‘recessed’ and below there is stainless steel to prevent the anchor and chain damaging the filling and finish of the hull. Of course the stainless steel is reflective, appearing from a distance as what you describe as a white patch, sometimes rusty-looking from the anchor. 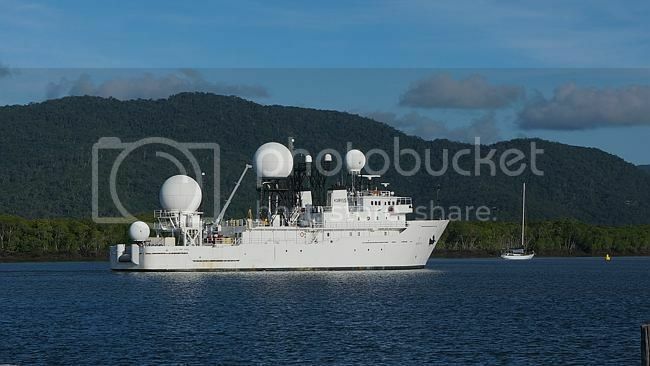 She looks like a Spy ship with all those domes. Any problem with subs in the area lately?? So thrilled to see these Kim! A favourite ship in a favourite city! 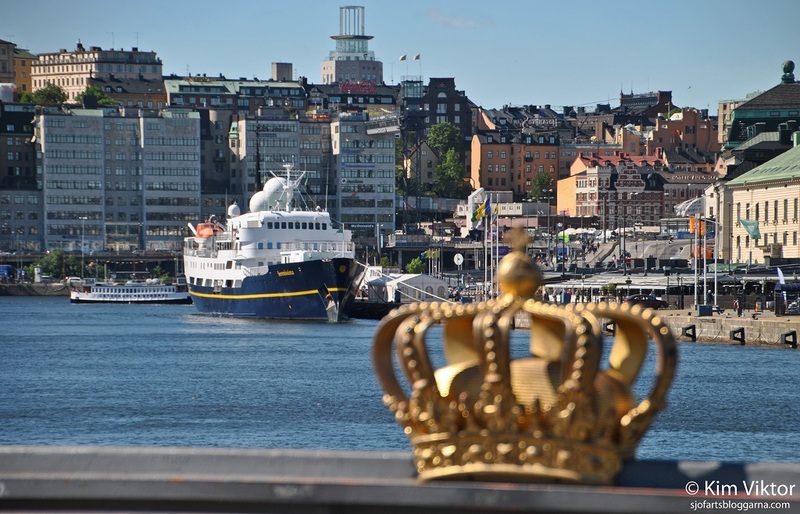 Great to see her in the centre of Stockholm, and such clever viewpoints with the crown motif and af Chapman. "Serenissima" north Tromsø strait back i july. Lovely images of one of my favourite ships, and good to see her when she was back in Norway. So good to see you back too Bengt. Thank you for the comment and yes it's good to be back again. Personally, I think it is BEYOND amazing that this old Lady is still in service, and in such a great shape. She perhaps sparkle more than she did at the end of her HRG-career. After studying pictures of you pakarang and Seagull I agree that the ship appears finer than ever. She has been a floating jewel. We haven't shared a single image of this ship in 2016? My fault (embarassed smiley). 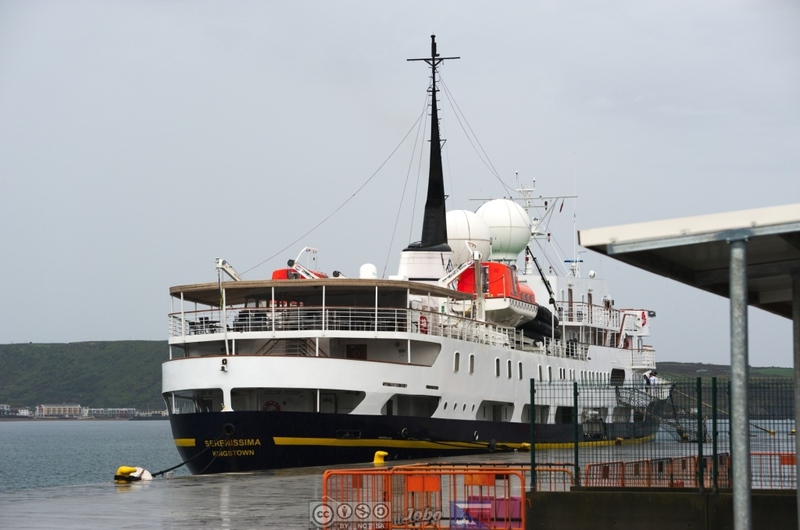 This summer of 2016 has been so complicated, but I shall see if I can manage to post not a trip report but at least a few photos of Serenissima in the Azores last April before I go off in just a few weeks to board her again ...in the Pacific Ocean! Your photos from such a special viewpoint are amazing. Thank you, Bengt for sharing. 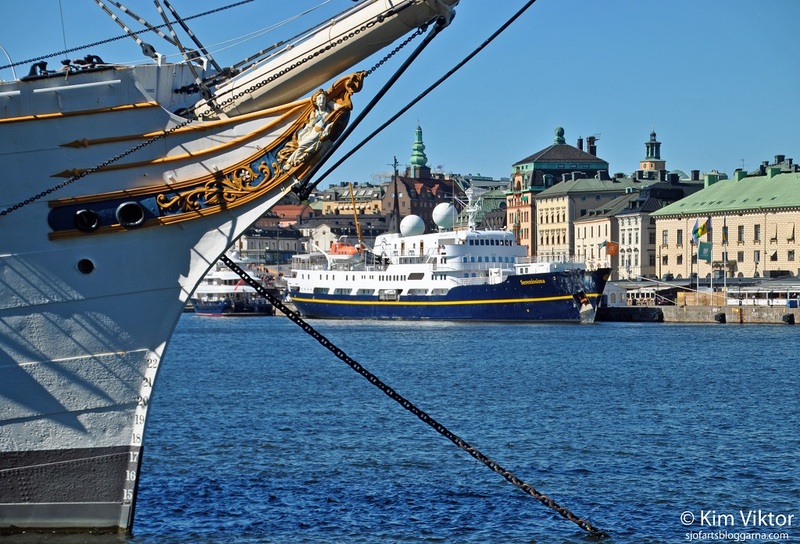 Is it just my impression or is she really deeper in the water at her bow than Lofoten? That would be astonishing for me, because she has no cargo inside? Cecilia, Was she well booked during the last season? What is your opinion? I have myself noticed many pictures of Andrea/Serenissima with her bow deep in the water. I don't know if this is really so, or if it is just an impression. I noticed that as well, and being a sister ship of the Lofoten, it seems rather peculiar. but I am sure Lofoten is higher out of the water, The two need to be together to be sure. Umm, I'd have to spend some time looking at photos of both ships to have any opinion on the depth in the water at the bow question. As for the second question:- She has always seemed well-booked on the cruises I've known about. But a variable is the number of double cabins released for single use. I booked the cruise I'm about to go on nearly a year ago, and already then there were no single cabins left. I am paying a lot extra for the single-use double, but not as much as if a couple had taken it. Also Noble Caledonia now seem to have a different policy than they used to regarding available cabins generally after bookings firm up when the balance payment is due 12 weeks prior to a cruise. They do now offer discounts for late bookings of unsold cabins, initially to repeat customers, who are a very significant proportion of their clientale. 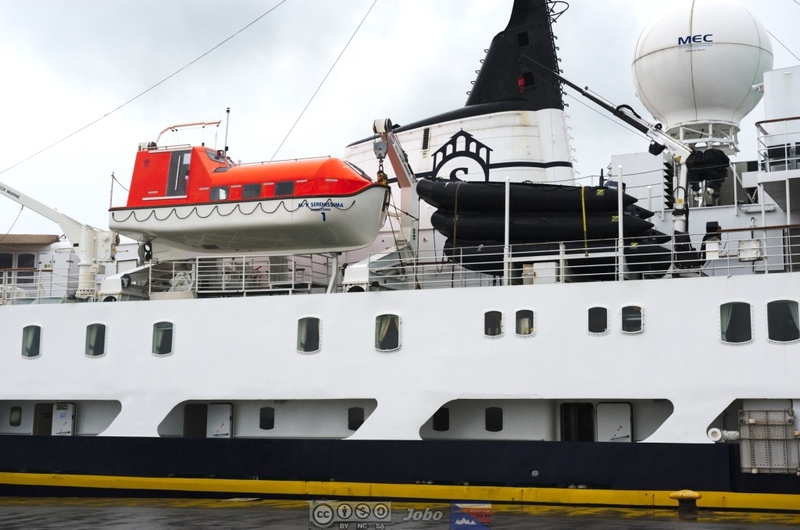 I have compared a recent photo of Lofoten online, switching back and forth between her and Serenissima. The latter does ride lower in the water (eg less freeboard) but does she carry many more pax? You can see pictures of Serenissima/Andrea low in the water on page 1 in this thread. Nari, there are actually fewer passengers on Serenissima:- max. pax 114, but usually not more than 100 and of course no day passengers like Lofoten. There are certainly several photos of Lofoten riding high in the water, with her red keel-paint showing. She looks all wrong like that but who knows - in all probability, she's trimmed for best seakeeping. I think it has to do with trimming. Look at the stern. In many pictures it looks like Serenissima is lower with her bow and higher with her stern. (These pictures are not the best examples, perhaps). Cecilia, thank you for your comments regarding the booking situation. I guess, that she has to be very well booked to earn money, that's why i "keep an eye upon her". Sigmund, the trimming argument is a good one, i think. Maybe also that they never know exactly hom many cargo they get in the next harbour...? By the way, happy birthday belately. Thank you, Ralf, thank you. 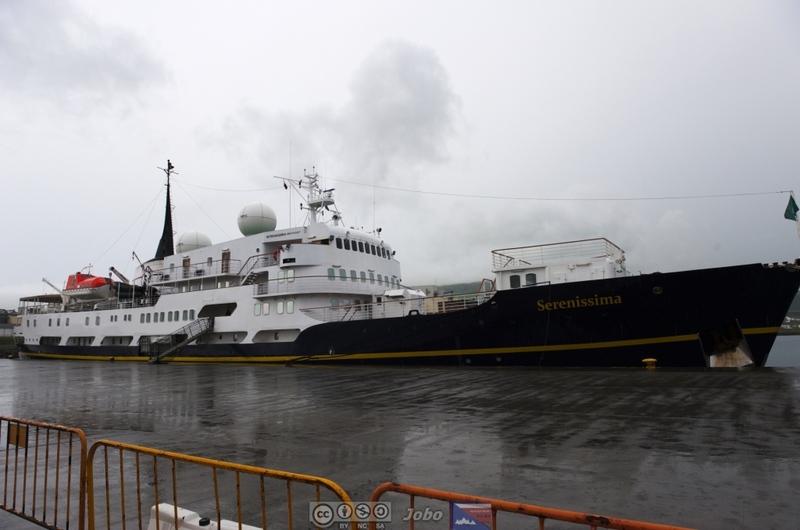 "Serenissima" in Miraflores locks this morning. Expect the Seagull closely tracking the passage and take pictures of everything that is worth taking pictures of. "Rotterdam" is also on the way to the Atlantic side this morning. "Serenissima" looks so small beside "Rotterdam"